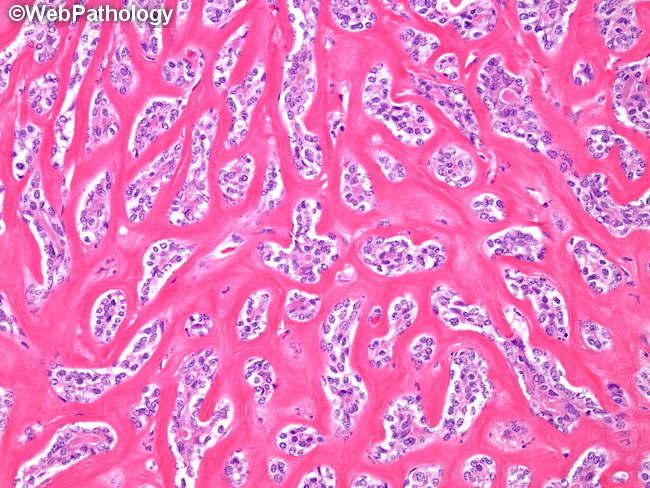 Immunohistochemically, the epithelial cells are positive for low molecular weight cytokeratin, CEA and EMA. The myoepithelial component is positive for p63, S100, calponin, actin and vimentin. Bcl-2, c-kit, and nuclear beta-catenin reactivity may also be seen. In this image, the basaloid cell nests are separated by copious amounts of eosinophilic basement membrane-like material.